Dan Simonds was named manager at the Padres' single-A Fort Wayne team for 1999, but team director of player development saw bigger things in Simonds' future, according to Simonds' hometown Cape Cod Times. The director, Jim Skaalen, told The Times, Simonds earned the job, and could earn others. "He's got all the qualifications of a guy who can manage at higher levels," Skaalen told The Times. "It's all about being in the right place at the right time, but I wouldn't have any hesitation of him managing at higher levels down the road." Simonds didn't necessarily get to manage at higher levels, but he has gone on to important posts heading up other teams, college teams. From Fort Wayne, Simonds moved on to Miami University in Ohio as the school's hitting coach. In 2015, he's a coach with IMG Academy in Florida. He's done all that after a pro career that lasted five seasons, with Simonds getting to AAA, but not the majors. Simonds' baseball career began in 1987, taken by the Orioles in the seventh round, out of Davidson College. That April, Simonds went 2 for 3 in a game, including a home run. With the Orioles, the catcher Simonds started at rookie Bluefield, hitting .270 in 54 games. He moved to single-A Fresno in 1988, then got his first look at AA in 1989 with Hagerstown. At Hagerstown in 1989, Simonds got into 46 games, hitting .246. He returned to Hagerstown for 1990, but got into just 11 games before moving to the Cubs system. The rest of 1990, Simonds split time between the Cubs' single-A team in Peoria and high-A Winston-Salem. 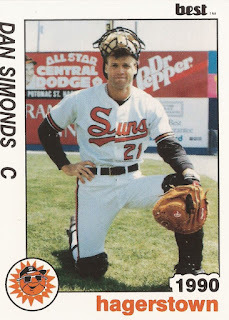 For 1991, Simonds moved up to AA Charlotte, hitting .247 in 34 games. He also got 20 games at AAA Iowa, hitting .125. It was Simonds' last year in pro ball. Simonds did make the majors the next year, making it to Chicago as bullpen catcher. He stayed in that job for three seasons before getting his first managerial job in 1995 at rookie Lethbridge. After going through the Padres' system and Fort Wayne, Simonds arrived at Miami University in Ohio in 2000. Save two seasons where he served as head coach at Xavier, Simonds then went to Miami. In six of his seven years, Simonds led his team to a better-than .500 record. He also saw off five players to the pros who were taken in the top 10 rounds, according to MURedHawks.com. In 2010, Simonds saw Adam Eaton off to the pros, Eaten taken in the 19th round. In September 2012, the outfielder Eaton debuted with the Diamondbacks. In 2010, though, Eaton came back from an off-season injury to lead Miami in offense, according to The Oxford Press. "He's a special player, that’s for sure," Simonds told The Press. "He plays the game recklessly, in a good way. He’s a throwback player."